What the blurb says: “In 2006, three-year-old Phoebe Piper went missing on a family holiday. Despite massive publicity and a long investigation, no trace of her was ever found. Seven years later, Molly Jackson, aged ten and recently uprooted to a Norfolk village, finds her great uncle Dan dead in his bed. Molly remembers nothing of her early years, but she’s been sure for ages that she is Phoebe. Everything in her life points to it. Janice – still in shock from the sudden death of her brother, and thrust unprepared into meeting her long lost daughter who she has always yearned to connect with – returns to Norfolk to her family home. It’s a place that holds many memories for her, not all of them good. It’s here that she meets Suzie – her daughter – and Molly – her grand-daughter – and tries to forge a relationship with both of them. But it’s not easy, and as the memories of the past mingle with the reality of her brother’s death, Janice begins to wonder if something, or someone, more sinister is at work. I found myself pulled headlong into Janice and Molly’s worlds. Through their narratives the reader discovers the events in their pasts that have shaped their sense of selves and identity, and how the secrets and suspicions that they hold influences each of their decisions in the present. One of the many joys of this book are the fabulous characters – they are so vividly drawn, and the dialogue pitch-perfect, that it feels like you’re watching real-life action unfold before you. A twisting, turning mystery of tangled secrets, guilt and regret THE WRONG GIRL artfully combines the dark undertones of past trauma with a growing sense of impending doom, and had me captivated from the first page to the last. 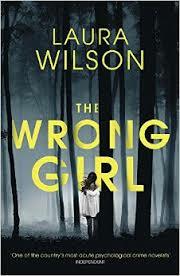 With stunning writing, vivid characters and bags of suspense, THE WRONG GIRL is a must read for fans of psychological thrillers – highly recommended. Events Alert: BritCrime 2015 – a free online crime fiction festival on 11-13 July! CTG! I’ve SO many books on my “urgent” TBR pile as opposed to the “no rush” TBR pile (yes I have two, many of the books on Kindle which adds to the confusion!) and now you’ve added yet ANOTHER to the former, mainly as your judgement is one I trust the most in Blogsville! I’d hoped the summer might calm down the good book frenzy (like it did with good singles when I was a teenager?!) but nope, not happening! Getting to it asap!